This one is due out at the NDMRS show in April of next year, so its all hands to the pump to get it done. 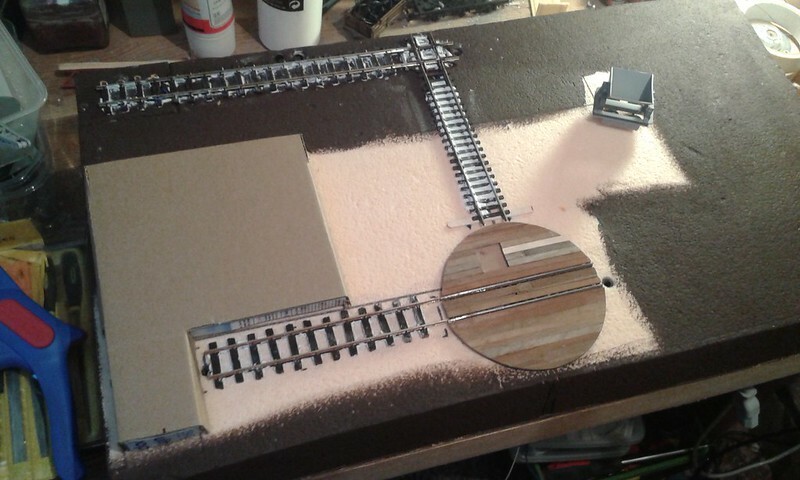 The turntable is crucial to the alignment of the rest of the track, so today I glued the track to the mdf top, and once that was set added one of the plastic sides to level the top with the top of the sleepers. I'll add the second one tomorrow, and then start planking it with gakked coffee stirrers, with one or two planks in fresh wood to show repairs. 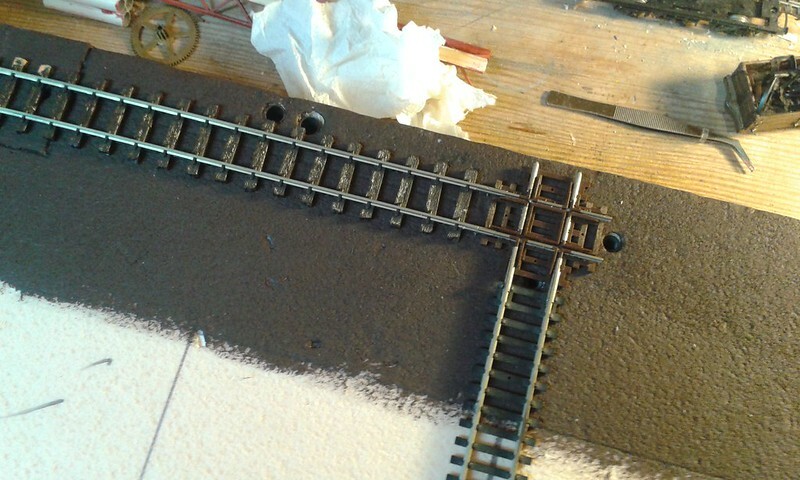 I painted the edges of the rails with a Humbrol light brown acrylic, dry brushed lightly with black when dry, to take the shiny off the sides. 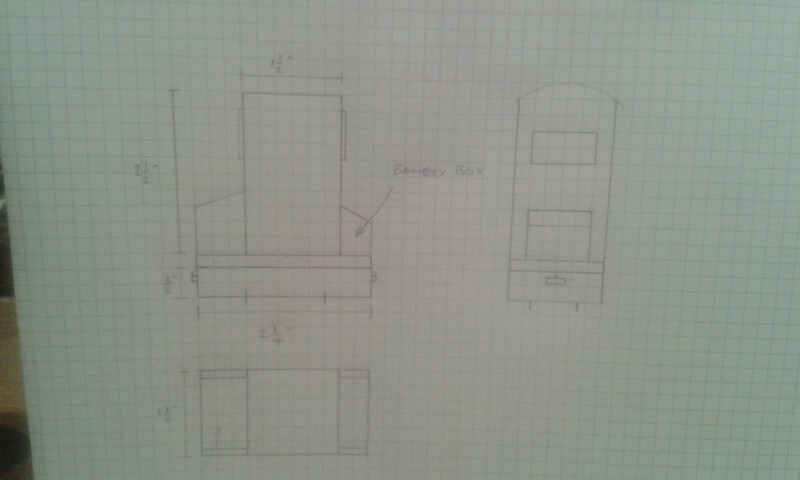 This will be laminated tomorrow and the holes made for the switches etc, before I fit it to the mdf back panel. Looks quite interesting. Watching and learning. 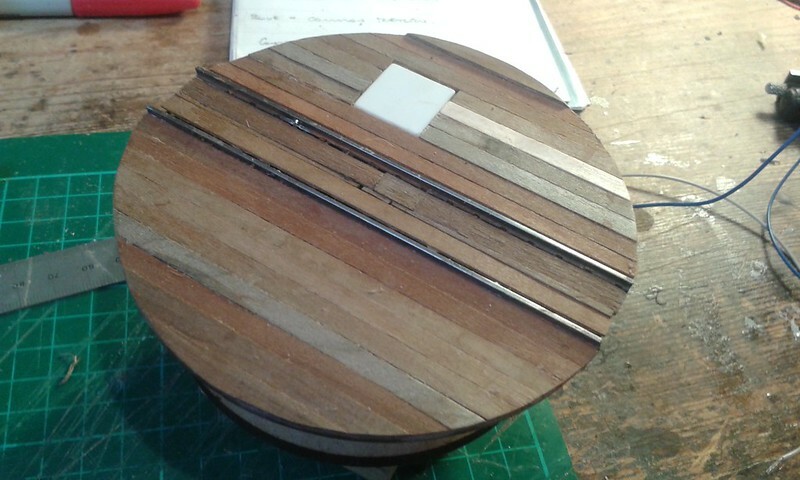 Be sure and say "hello"
The other side will have an inspection hatch set into the planks, and the whole thing will be trimmed and sanded into a circle slightly bigger than the plastic once the planking is all on. 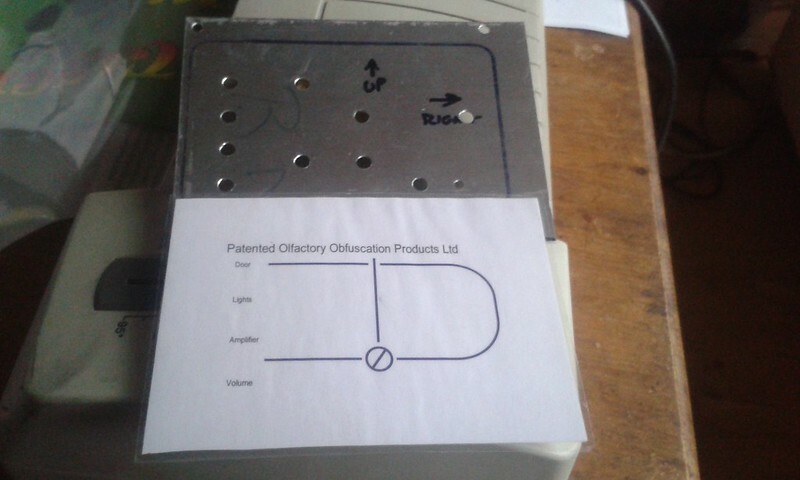 I've also printed, laminated and cut the control panel overlay. 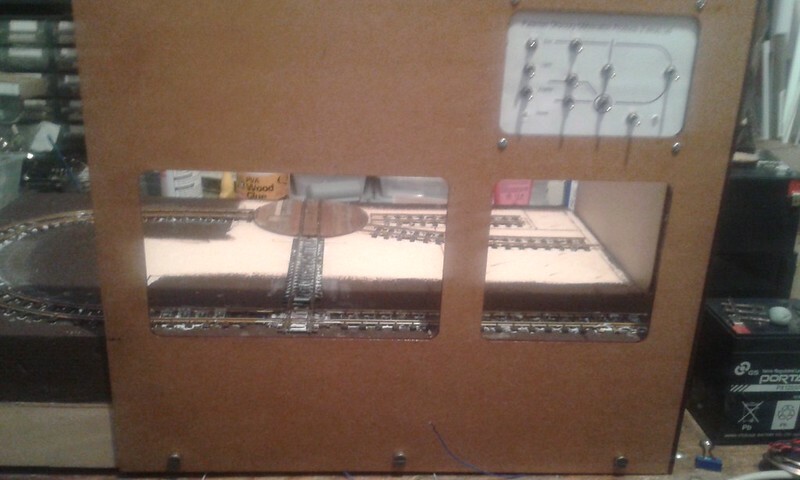 The aluminium panel was made ages ago, next is to glue both together and open the holes for the switches and LED. Just the pot. for the volume and lucky green LED to add, then connect it all up, then I can think about laying the track. 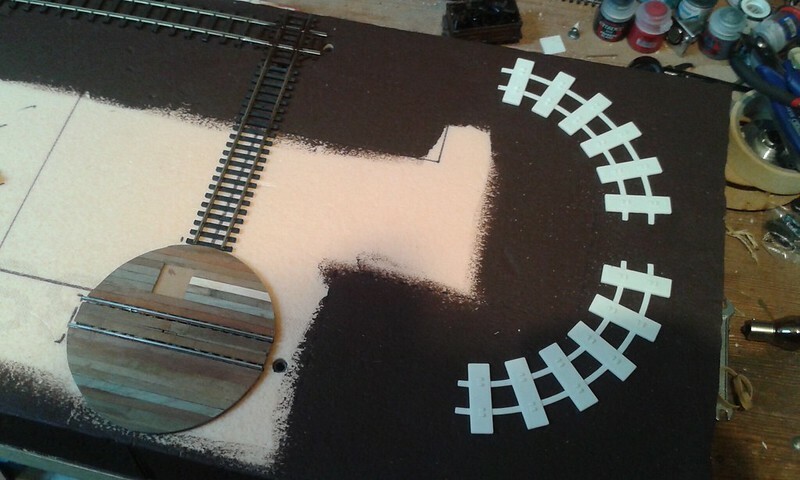 Today I made a start on the track sections. 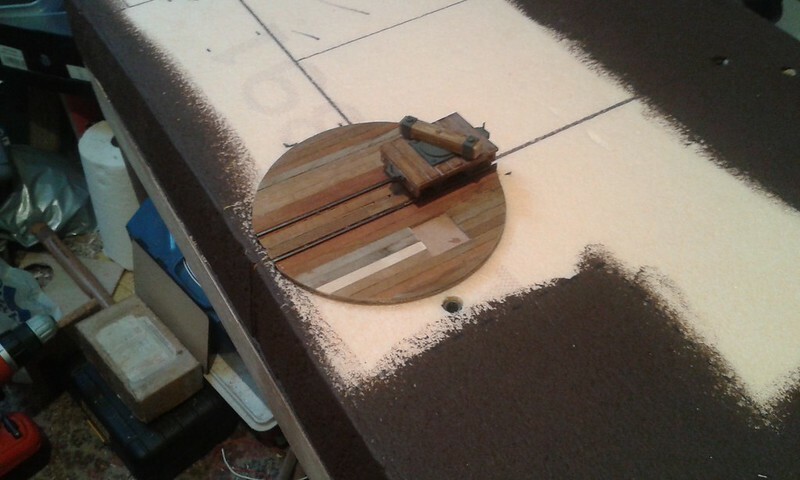 Alignment with the turntable is crucial, so I made the section which runs into the shed first. 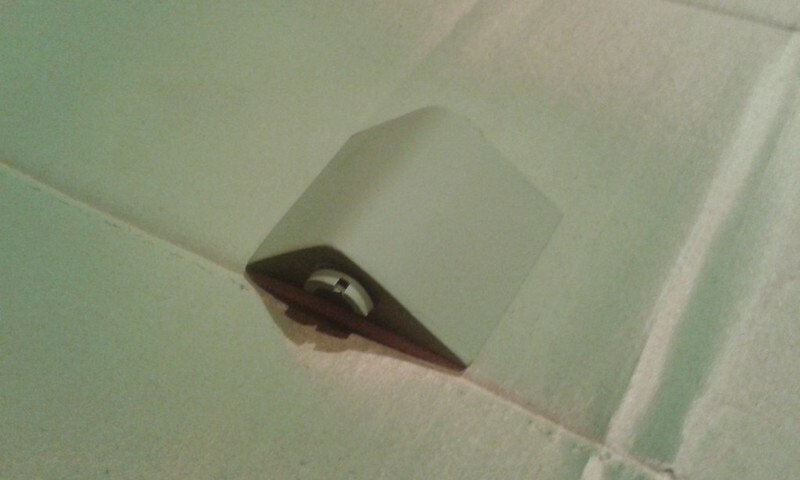 This is a piece of Hornby OO straight track with 1/2" or so trimmed off. It joins to the Atlas square crossing inside the shed. It will be buried in the ground cover (DAS) so the sleeper spacing etc doesn't matter. The track which will act as the fiddle yard inside the shed is a piece of Peco On30 flex track which needed trimmed by 3/4" or so. It was the nearest in length piece of track I had to hand, and really won't be seen, so in it went. I also had a look at the curve at the right hand side. 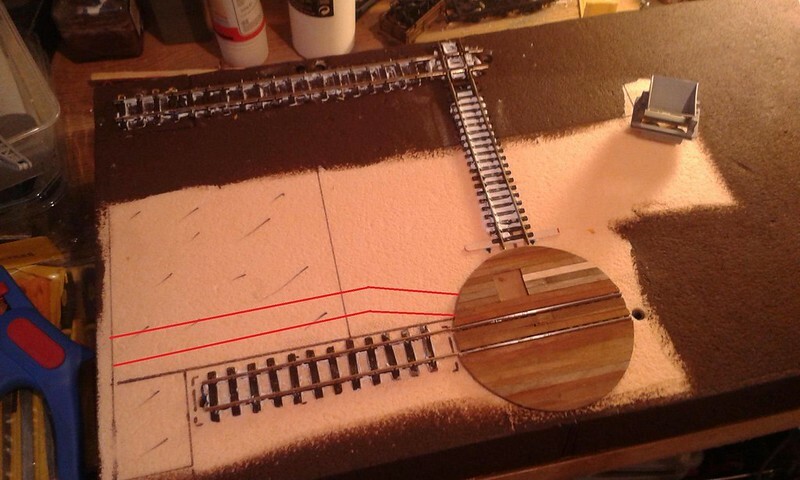 I'm not sure whether to use the 3D printed track base here as it will be lost in gravel and weeds, so might well use another full length of Peco On30 flex track run through the rail bender instead. The 3D printed base will give a steadier curve, though. A bit of a bonkers week in work, so no progress until today. 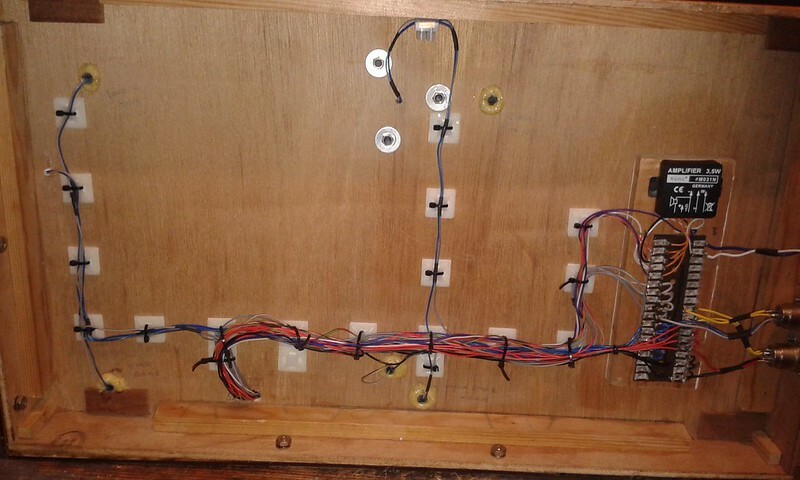 Power feed were soldered to each track section prior to fitting and dropped down through the pre-positioned plastic tubes. 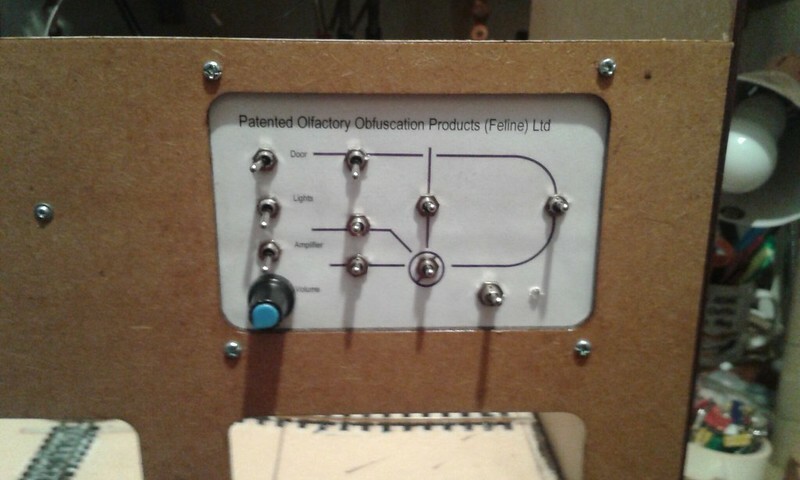 Care was taken (and a meter used) to keep the polarity of each piece correct. The track sections are now held down with heavy lead / acid batteries, and will stay that way until the morning. Now that the track is down and set firmly in place, some revisions and modifications have been suggested. would add to the operational potential (big words and everything today ), which seems like a good idea to me. 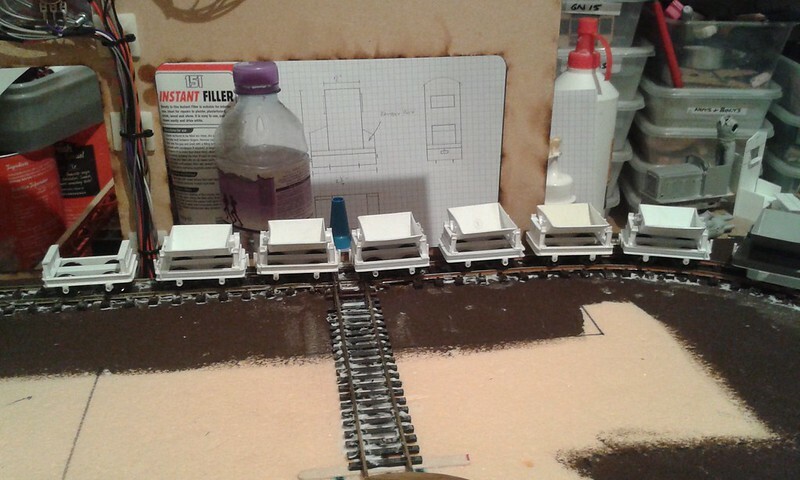 The area of the loading bay will need to be reduced, which is no problem and means I can make it a wooden structure rather than brick / concrete as was originally planned, but on the plus side I'll have room to store full loads of litter ore for processing as well as empty flat cars awaiting bagged cat litter for dispatch as well as making shunting that bit more interesting. 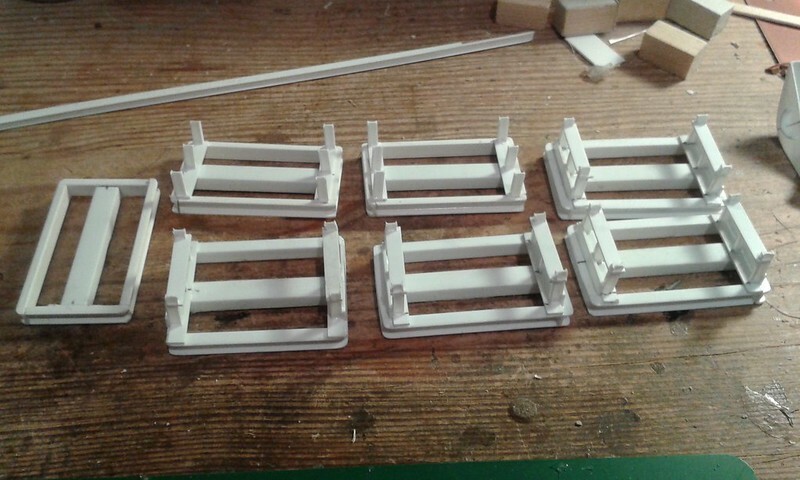 The turntable will hold one wagon plus locomotive, so there could well be lots of short movements. The space at the end of the current short siding will become locomotive fuelling and light maintenance. with a bit of a lean to added to the brick wall which makes up the side at that end. The control panel will also need to be modified. 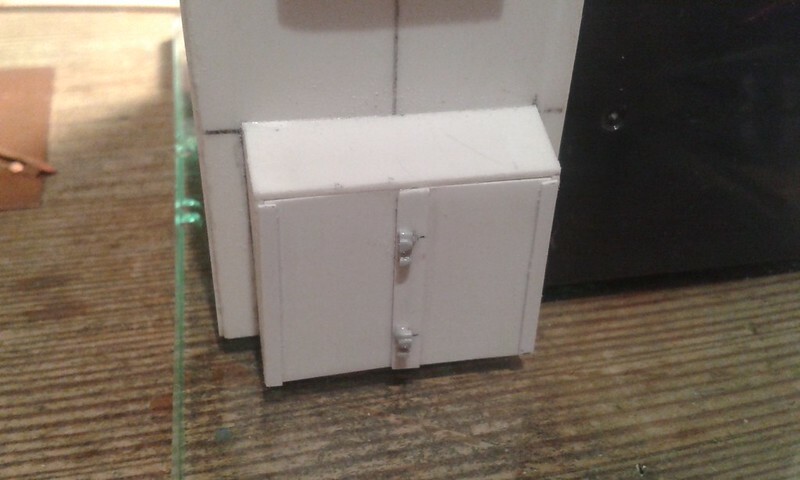 This works out well as I've one of the small switches left over and felt a bit sorry for it as it wasn't going to be used and I felt it was lonely and crying in the switch drawer. Happily it appears to work ok. I need to add sleepers to the turntable ends of the two sidings, and will when the turntable comes out again. 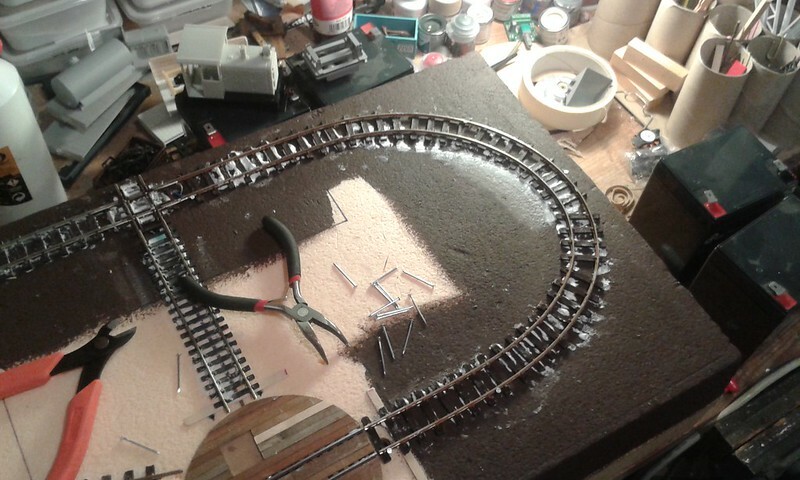 Next is to make the curved track for the right hand end. I'm going to make this in two pieces, with the first piece joining to the square crossover, and ending half way down at the side where there is 1 1/2" or so of a straight. Once this is made and stuck down, I'll add the second piece to meet up with the turntable. This will hopefully make things a bit easier to fit and align. Last for today. There is wine with my name on it. Using a lot of jump leads to power the track, I tested running on to, off and across the turntable. Thankfully, with very careful alignment, it worked too, although there is no margin for error at all. Wagons, especially when empty, will need to be heavy and consistent in their weight to ensure reliable running. Thankfully I have plenty of lead . 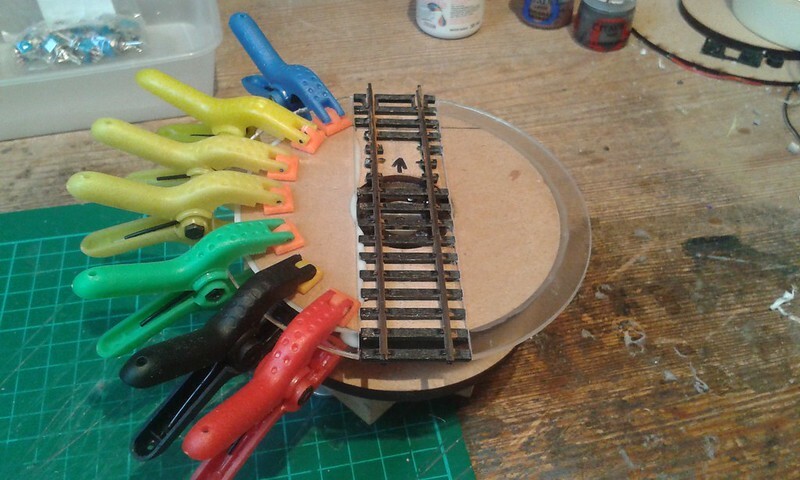 The original left hand siding needs to have its rail height lowered by 1/2 mm or so as it is causing occasional derailment when moving left to right on to the turntable. 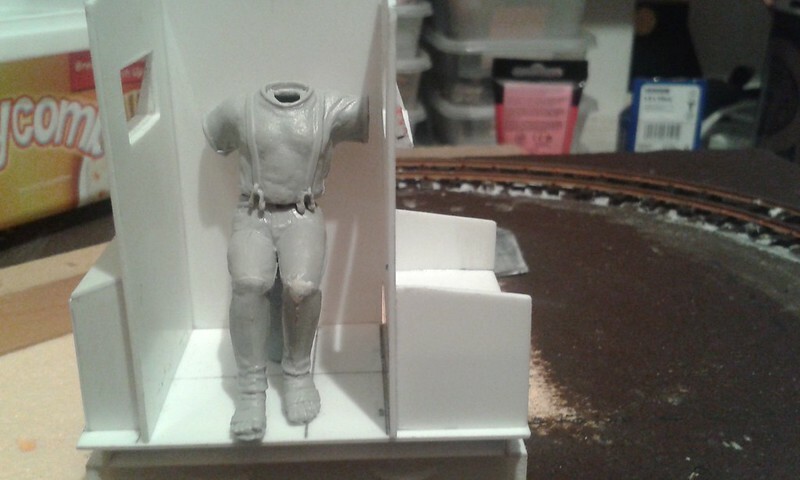 This should happen by fitting a sleeper and sticking it to the foam base. The differential between the code 83 square crossing and the code 100 Peco track will be addressed with a file as there is a bit of a bump there too. 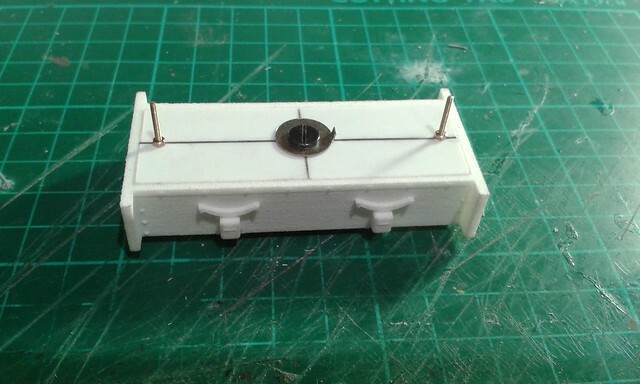 The most annoying thing is that the dead section of the square crossing matches the wheelbase of the Bachmann 0-4-0 perfectly, resulting in a stop unless travelling at speed. I refrained from harsh language once I found this, and will try to think of a cure which does not involve major track surgery. Thankfully the area in question is off scene, so if the big hand is needed its not the end of the world. 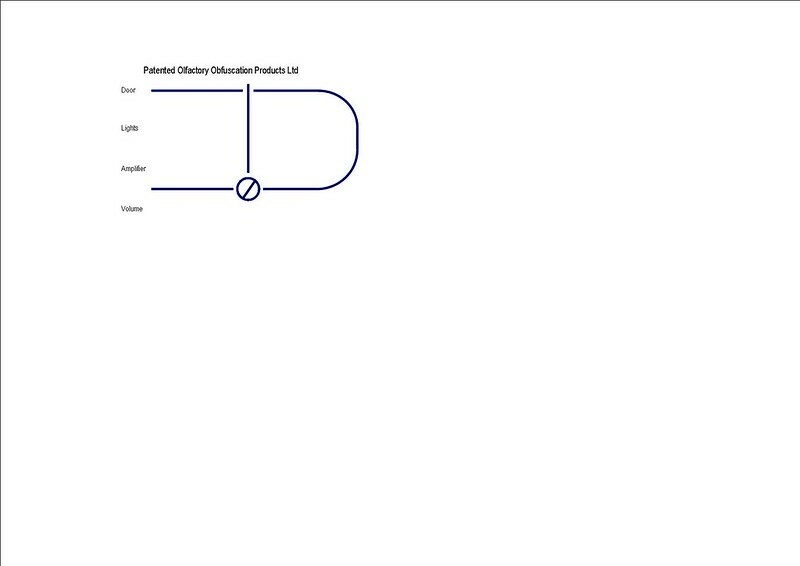 As an experiment, I tried some other 4 coupled locomotives to see if a suitable substitute would work. The Hornby "Smokey Joe" type doesn't like the radius at all (so no visits from the fireless crane or vertical boiler locomotives), a Bachmann On30 Porter 0-4-2 derails the trailing bogie. I've an 0-4-0 as well, but couldn't be *rsed didn't take the time to get it out. A Model Power Hustler also doesn't like the radius. There is a Spud in a box with some other bits which should be ok, but I can't currently find it as it was bought in January and is under some layers. So.. that's the track down, and mostly working. I'm happy with progress today, and will let the whole thing sit until (hopefully) tomorrow evening when I'll have a look at the revised control panel. 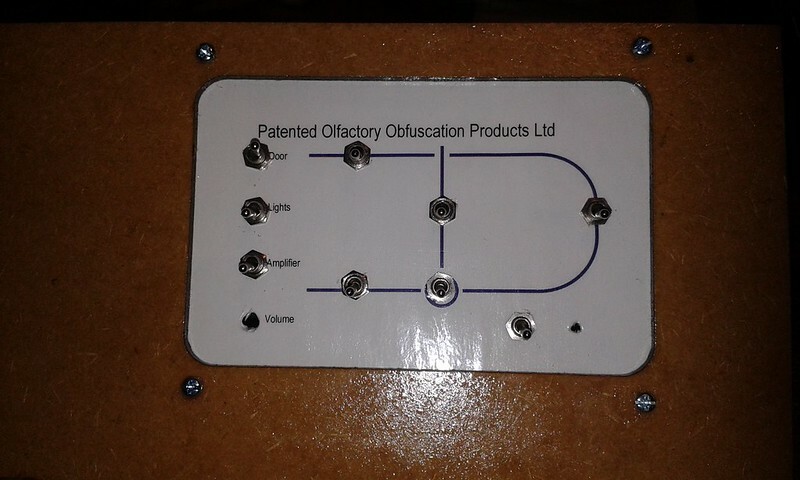 I've taken advantage of the revision caused by the new siding to move some of the text round a bit and amend the name to "Patented Olfactory Obfuscation Products (Feline) Ltd" in case there is confusion over what sort of litter it actually is. Best to be careful with these things. Why do you need a dead a section in the crossing? I'd power it. Its the nature of the piece of track. 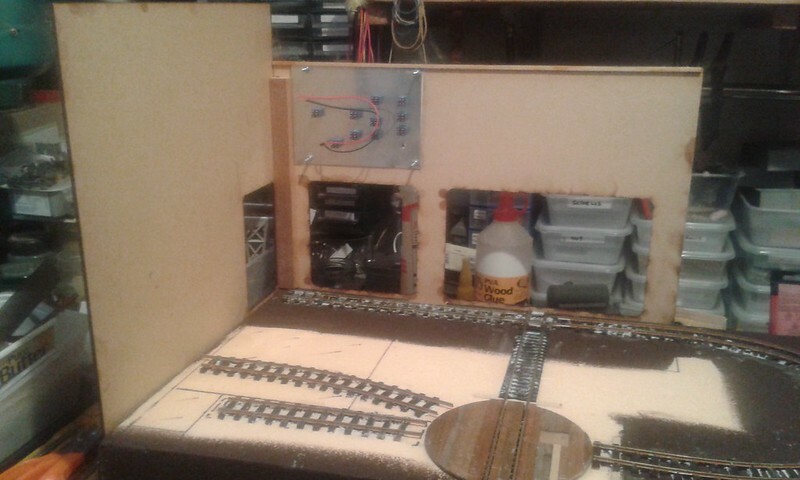 Its a bit like a dead frog point - there are plastic sections between the powered rails. I'm away this weekend (unsupervised, too) so there probably won't be a lot done. In light of this, 'cos I was home early from work (1pm finish on a Friday), I fitted the back and side mdf sections. They'll likely be off again, but with them in place I can get the wiring done. 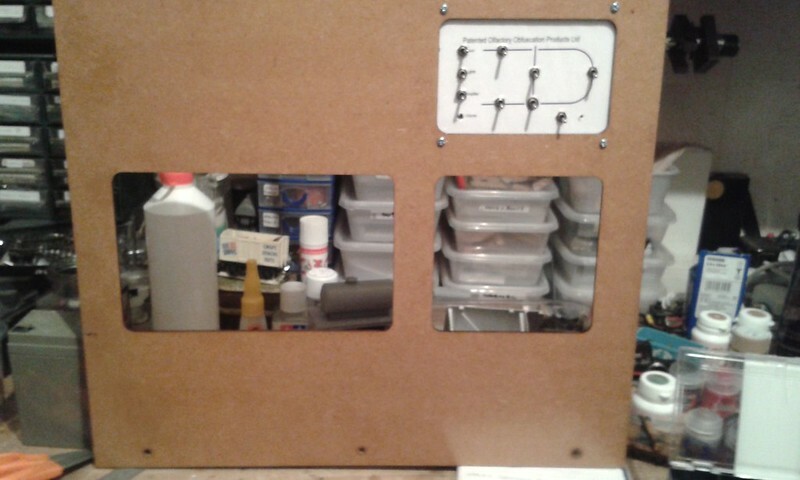 I reprinted the control panel to reflect the new siding through the week, and drilled / fitted it on Wednesday evening. The left hand end will have a very low relief 2 1/2 storey office building back, probably made of brick, with a door out to the loading dock and blacked out windows. The back will have a corrugated iron shed from the end of the mdf panel joining to the offices, extending out to the edge of the brown paint. 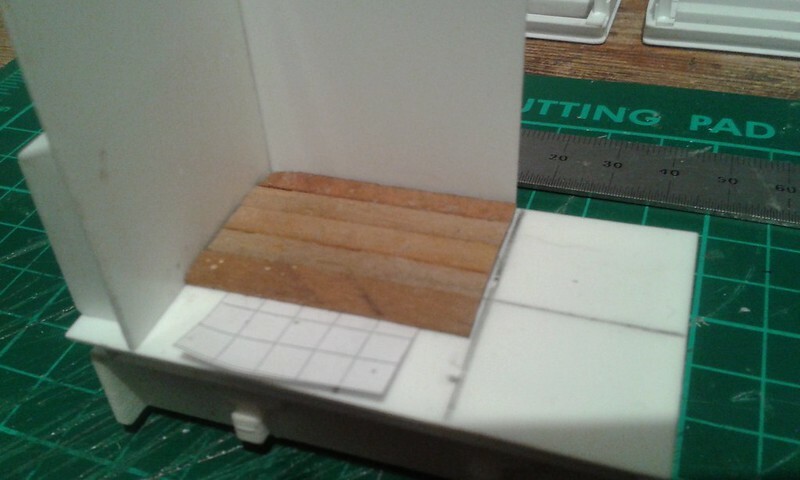 The curved roof will attach to the top of the mdf panel. The track from the turntable will run into the shed through a sliding door, with just enough room to hold a locomotive and one wagon on the square crossing. The hand of Les will deal with unloading after the locomotive reverses and the door closes. The new bit (a "distribution node" which tells me I'm watching too much Star Trek) beside the control panel deals with some "topside" bits. 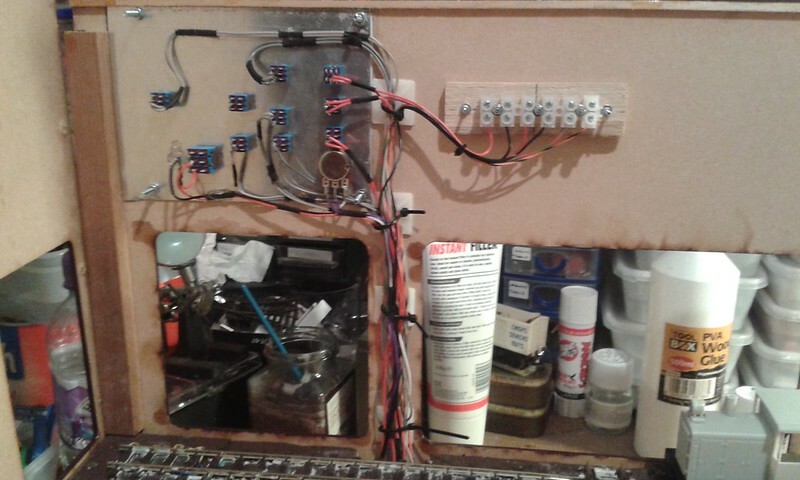 There is the power for the lights, the trigger for the MERG "EzyPoints" servo module to operate the door, and the connections for the speaker. 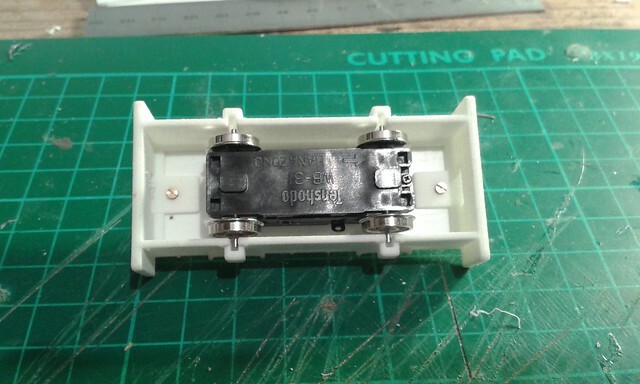 One of the switches (the one for the Lucky Green LED) broke while I was refitting it after soldering the wires to the back of it, so a slightly larger substitute was used in its place. So.. after a soldering marathon, I applied power to the whole thing. And, to my delight and also some surprise, it all worked . 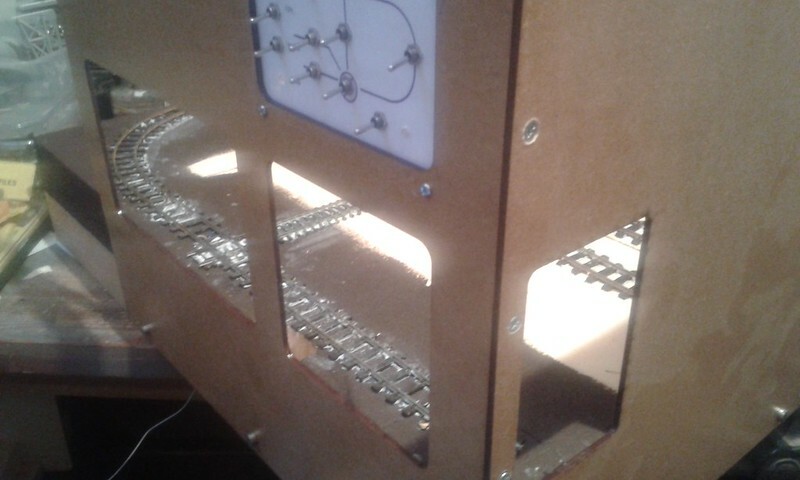 I initially tested the 12v circuits, everything switched on and off as it should, so then connected a Mk4 controller and tested the track voltages and isolation switches. All good again, with one slight problem of my own making. The fiddle track to the left of the square crossover and the curved section of track are meant to be two separate electrical sections. As I forgot to add insulating fishplates at the square crossing there are currently one big section. I'll cut a slot in the rails with a fine disk before too much more happens, as I'd like these sections to be electrically separated and switched. Finally, the first train ran. P.O.O.P no. 1 (the as yet unmodified Bachmann Davenport) pushed the prototype skip wagon to the front siding, reversed, and parked up on the "new" siding. As the skip has no couplers that was as far as it went. 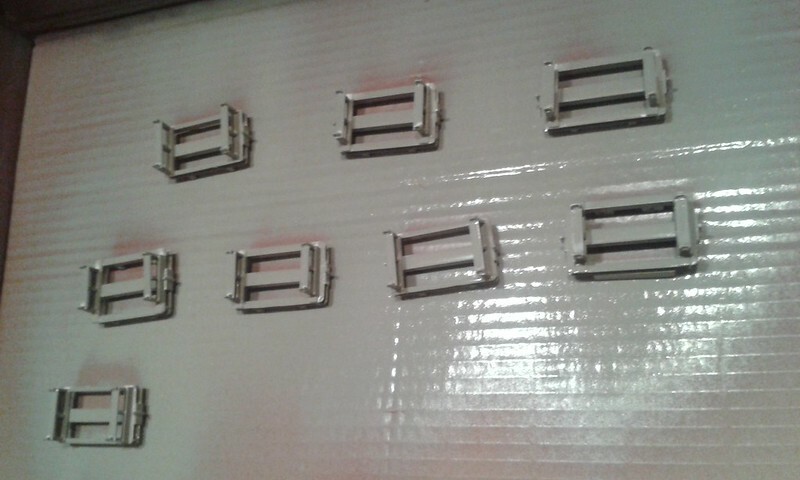 Next is to order some grey wire and finish the connections. I'll need a lot for this and future projects (grey is "track section +, switched" in my wiring scheme) so 100m ought to do for a while. I'm going to take the next couple of weeks playing with the trains testing the running, making more skips and flat wagons, as well as locomotive no. 2. Then its on to ground cover and buildings. Trains have run, and it mostly all works. Next to make the small locomotive to bring the skips from the offstage mine and take the loaded flat cars to the (also offstage) warehouse. 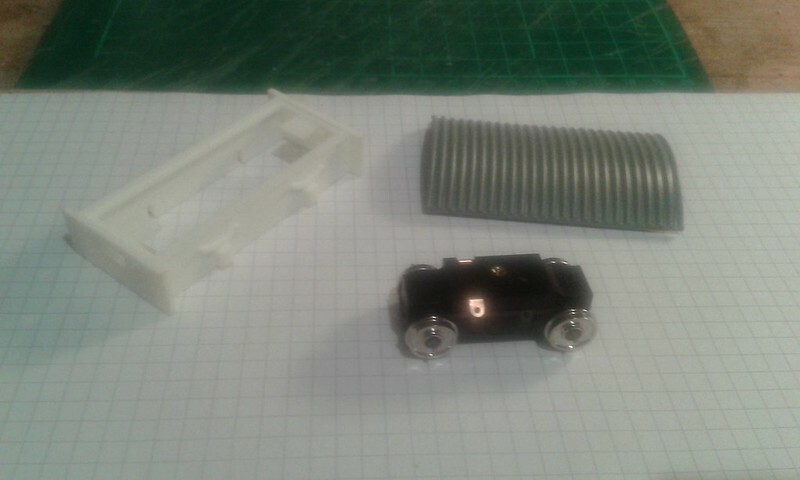 which are a 32mm Spud, 3D printed chassis for same, and the roof from an Airfix Dockside crane (there should be no surprises there, this kit is the gift that keeps on giving). What I'm thinking of is a very small (2 3/4" or 5' 6" long in real life) battery powered "locomotive" with a cramped cab more or less in the middle and battery boxes at either end. 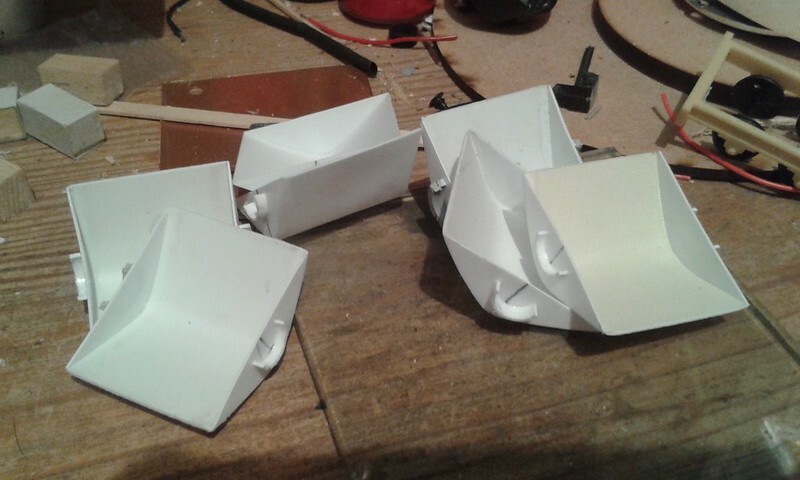 One of these (probably the front one) may well have the lid off to show a couple of batteries and their wiring. (It never, ever rains in the F.L.U.B.W universe so short circuits are conveniently avoided.) 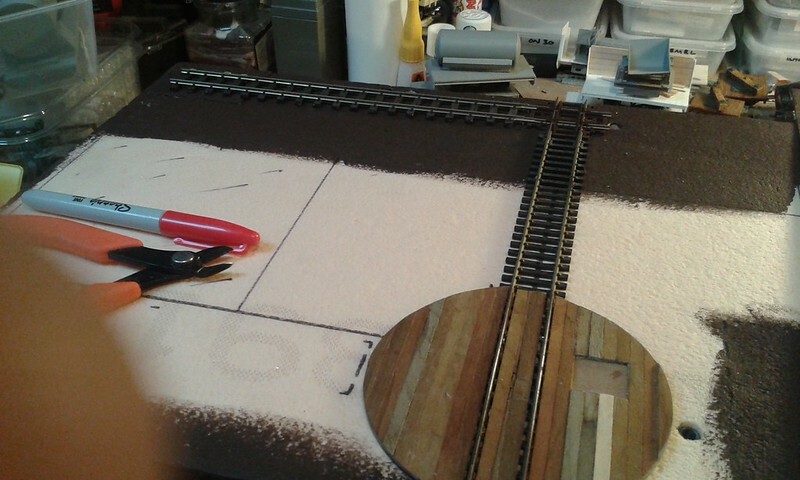 The width is 1 3/4" (3' 6" in 1:1 scale) which is slightly narrower than the Bachmann Davenport, and as such will clear everything it needs to. which gives the (very) general idea. The driver (to be a modified Italeri truck driver) sits sideways in the cab, which is open at the right hand side, and has windows back and front. The Dockside Crane roof shortened a little will do nicely for the cab roof, and the Italeri "Truck Accessory" kit which is supplying the driver also has a couple of lights and other detail parts. 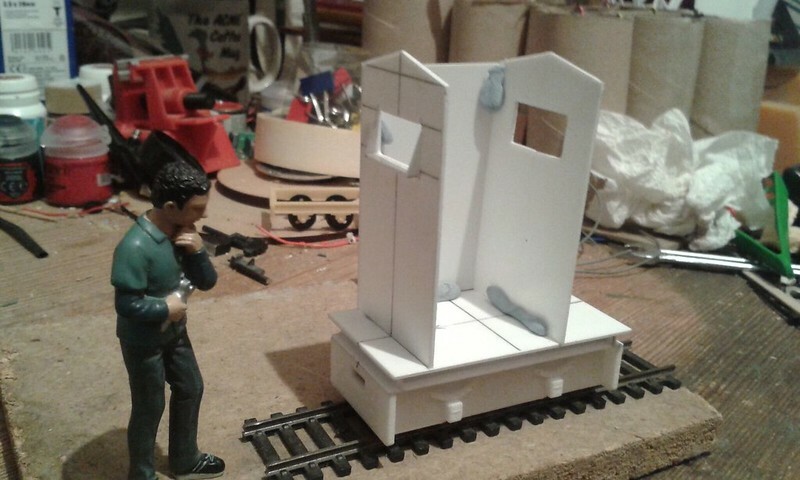 I've based the size of the cab on the Steve Bennett conversion kit for the Bachmann 0-4-0. Suitable controls will also be added. 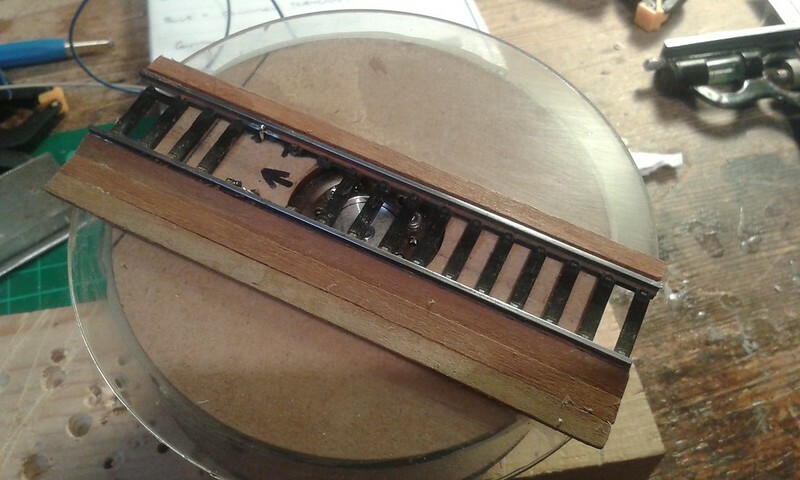 There is to be a styrene channel on its side between the top of the 3D printed chassis and the bottom of the footplate (much the same as the Road Runner locomotive) to allow for a fair bit of lead ballast low down. This should give fairly good adhesion. The most that this critter will be pulling will be three loaded skips at a time (there's not room for many more) so it should manage ok.
Nowt done for a while due to work etc, but finally some progress today. The brass bolts have since been trimmed. The unit runs nicely on the layout, and has a short enough wheelbase to cross the square crossing without losing connectivity. It doesn't like leaving the middle siding, but this may be down to lack of weight. Next is to make the footplate and supports (typically I've every thickness of styrene except the one I want) then add lead. This might happen on Wednesday evening all being well, another busy week ahead. For no really good reason it has been a while since I've posted in here, and there has been some progress made. which are slowly reaching completion. The next big construction is the end wall on the left hand side. This is extreme low relief (max. 10mm thick) with blacked out windows and a door to the loading bay. I've ordered 1:24 brick embossed styrene to make the wall; it should arrive this week then I can start to see how to go about the thing. I've a few ideas, but need to see the bricks to make a plan. Hi Les, I’ve just gone back and looked over this thread. Great modelling. 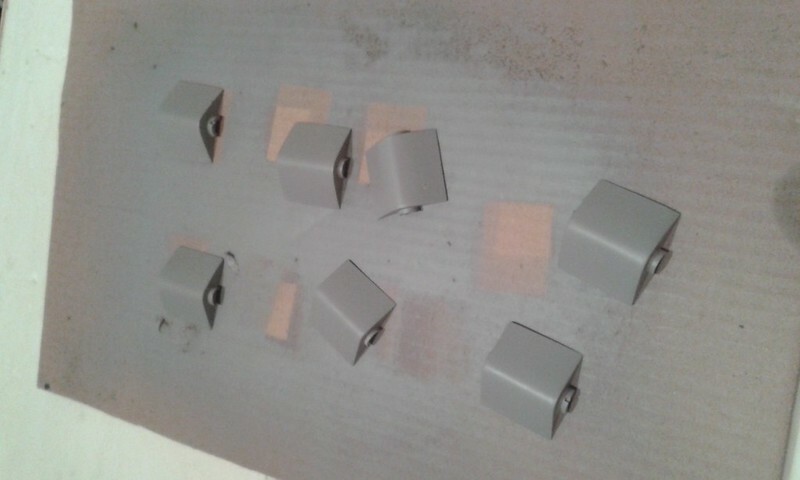 The glue is setting on the last bits - mainly couplers - so all being well I'll get them primed either through the week. Final colour will be green, with fairly heavy weathering to follow. I'll not be sorry to see them done, as they seem to have taken forever.